VWAA welcomes law students as members and encourages law student member participation in chapter events and programs. Law students are given FREE membership in VWAA. Look for VWAA chapter events at local colleges and universities. In the past, events have been held at the University of Richmond Law School, George Mason University Law School, Washington & Lee University Law School, and Regent Universtiy Law School. The Richmond Chapter hosted special events entitled "The Robe Becomes Her: Women Judges Share Their Pathways to the Bench" in 2016 and 2017 at the University of Richmond Law School featuring outstanding members of the Virginia judiciary. The Honorable Marilynn C. Goss, Richmond Juvenile Domestic Relations Court; The Honorable Jacquline S. McClenney, Richmond General District Court; and The Honorable Bonnie Davis (Ret. ), Chesterfield Juvenile and Domestic Relations Court; and The Honorable Catherine Hammon (Ret. ), Henrico Circuit Court participated in one or both of these events. Attendees learned how judges are selected and were able to ask questions of the panel. 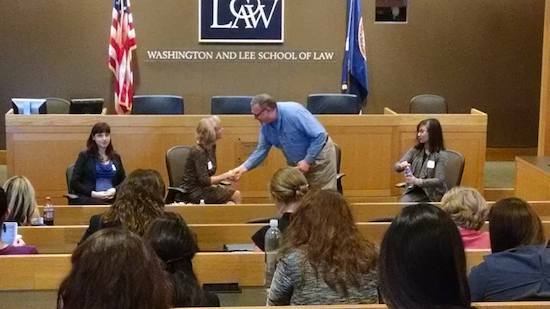 Multiple Roanoke Chapter members participated as panelists in the Washington & Lee Women in the Law Symposium - "Dare to be Different" at Washington & Lee University Law School on October 30, 2015.